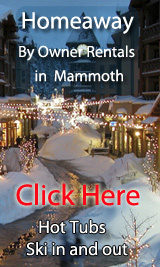 Find your own ski in and out by owner rental in Mammoth-click on this link! Find petfriendly restaurants, daycare, local parks, check out www.petfriendlymammoth.com ! Ultimate Mammoth Condo, Summit Grand Bldg, Walk to Eagle, Dog Friendly - One Bedroom- 1 Bathroom - Sleeps 4 - Ave $112/nt-- Book it! 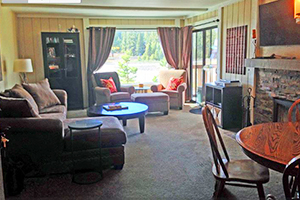 VRBO 497458 - Beautiful corner unit with some of the best views in the entire Summit complex. Just a few steps to the lifts in wintertime and easy access to all those great summertime activities; you can't beat this location and this unit. Our condo is perfectly suited for both your romantic and your family vacation. 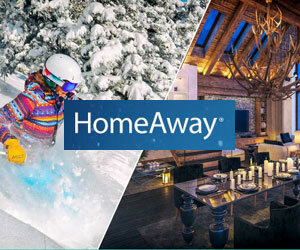 We take pride in our owner-operated unit and want to provide you an experience above and beyond your typical Mammoth rental. We invite you to come stay with us and experience everything Mammoth has to offer. 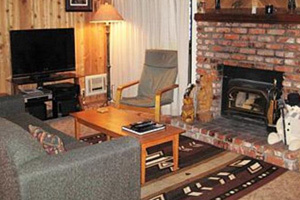 Village #2416 - 1 Bedroom/ 1 Bath...Just Steps to Gondola!- 1 Bathroom - Sleeps 4 - Ave $145/nt-- Book it! VRBO 438207 - A true ski-in/ski-out location! 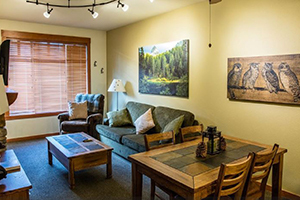 This beautiful, 1 bedroom, 1 bath condo is perfectly situated in White Mountain Lodge, directly above The Village restaurant and shops, and just steps away from The Village gondola. This is the perfect place to spend your Mammoth Vacation! Located on the the top floor, this condo offers an upgraded living area. Relax in the evenings by watching your favorite show or movie on the 42" flat-screen TV or play games on the x box game station, then get a great night's sleep on your King-size bed. Also offered is: a full kitchen with granite countertops, gas fireplace for those brisk winter evenings or cool down during the summers with air conditioning, PLUS all the amenities you have come to expect at The Village. Spoil yourself in White Mountain Lodge #2416! Enjoy the year-round heated pool, 3 Jacuzzis, workout rooms, free Wi-Fi, gondola, shopping, restaurants, and underground heated parking. Non-smoking. Pet friendly (with a one-time, non-refundable fee of $75/stay/dog).Wifi, Hot Tub, wheelchair accessible. Beautiful Upgraded Village Condo Just Steps to Gondola! Dog Friendly - One Bedroom- 1 Bathroom - Sleeps 4 - Ave $153/nt-- Book it! VRBO 772146 - Take the elevator down to your own private ski locker and step outside to the gondola located here in the Village. Then, after your epic day on the mountain, take the ski back trail right down to the Village and enter the building to your ski locker. Take the elevator upstairs and now it's hot tub time! 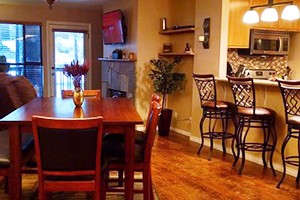 Gas Fireplace; Private balcony on 4th floor; Fitness Center; wifi, hottub. Gorgeous Condo - Walk to Eagle Express/Chair 15! Pet Friendly!- One Bedroom- 1 Bathroom - Sleeps 6 - Ave $134/nt-- Book it! 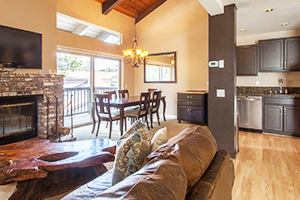 VRBO 645600 - Newly remodeled & beautifully rustic, Summit 1 bedroom/1 bath condo plus Alcove. This roomy, 925 square foot space is walking distance to Eagle Lodge and Eagle Express Chairlift, Sierra Star Golf Course and right on the bus line. Pets are welcome with prior approval/security deposit. This luxury Condo has been completely remodeled from top to bottom with new granite countertops, new stainless steel appliances, new slate & laminate flooring throughout. Sleeps 6 comfortably; master bedroom has King bed with king-sized pillow top mattress, cozy down comforter, wireless remote controlled ceiling fan and light combo, a 37-inch flat panel HDTV complete with HD programming/cable box. The master bedroom also contains a beautiful granite and wood vanity & sink combo to help reduce over-crowding at the main bathroom during busy times. There is also a full sized matching dresser with night-stands and a closet with full length mirrored doors. Hot tub, wifi, petfriendly, walk to lifts. Hidden-Valley-Condo- 1 Bedroom - 2 Baths - Sleeps 6 - from $133/nt -- Book it! Trip Advisor FKN2124435 -This is a really beautiful condominium! Walking to the Village Gondola from this unit is considered 3 blocks including a long steep driveway to reach Lake Mary Road. It is a nonsmoking, 1-bedroom and a loft unit with 2 bathrooms, new carpet and tile and a 3 star rating. It has a full kitchen, microwave, fireview woodburner, 2 TVs (including a flat screen TV with high definition cable, bose speakers and an amp in the living room), VCR/DVD player, free wireless internet service, stereo with a cd player, and 2 hairdryers. There is not a phone in this condo. The living room has a queen fold-out couch and a single fold-out couch, the bedroom has a queen bed and the loft has a queen bed and bunkbeds where the bottom is a double bed and the top is a single. Two futon mattresses are also available in the closet. There are 3 flights of stairs to reach this unit and it has 2 levels inside. The entry level has the living room, kitchen, bedroom and a bathroom. Upstairs is the loft with another bathroom. This unit sleeps up to 6 people. Hot Tub, Wifi, walk to lifts. 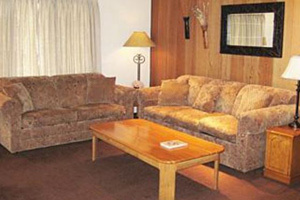 Prime Location Ski in and Ski Out (Unit 212) - 2 bedroom -2 bath - sleeps 7 - from $203/nt- Book it! VRBO 50235- Quiet end unit in Bridges. Looking for a nice place to relax and ski or board to your hearts content. Get up here. End unit is quiet and has views out to the forest. Board or ski right from condo. Have lunch at a lodge or ski right to front door for some hot food with no lines. When done for the day sit in your own private hot tub on deck. Take in the views of the valley while enjoying a cocktail. BBQ right on your own deck. We are just off of Lake Mary Road only a mile from the Village. Master bedroom has a queen bed, private bath and is nice and quiet in the back of unit. Second bedroom has a queen bed and roll-a-way with a Jack and Jill bathroom attached. Washer/Dryer in unit. Queen sleeper sofa in living room. Enjoy cooking in the gourmet kitchen open to the living room. Kitchen fully stocked with coffee pot, crock pot, rice cooker, toaster, and glasses for any drink. Wood burning fireplace in living room makes for cozy game nights and hanging out. Underground 2 car garage makes it easy to park and not have to scrape windows. The Bridges condo complex is just up the road from Mammoth Village. Hop on a Shuttle for a night out on the town. Ski to lifts! wifi, hot tub, wheelchair accessible. Upgraded Town Home Just Steps to Canyon Lodge- Nearly Ski in Ski Out- Sleeps 10- 3 bdrms 3 baths- ave nightly $245- Book it! 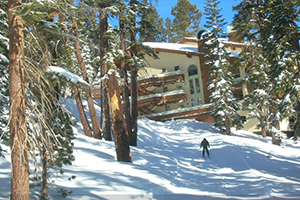 VRBO 863724 -The Canyon Lodge vicinity is one of the premiere locations for skiing Mammoth Mountain. Here, you'll have access to a myriad of amenities including lockers, ski school, laundry facilities, swimming pool, spas, a sauna, game room and more. The lifts are just steps away from your front door, putting you at the front of the line for fresh tracks in the morning, and you can also conveniently ride the gondola down to the village and back again during operating hours.Nestled within one of Mammoth's loveliest residential areas, this fully remodeled 2 bedroom plus loft, 3 bath, is situated less than a block from Canyon Lodge in the newest phase of the desirable Chamonix condo complex. Chateau San Nom - 4 bedrooms - 3 baths - sleeps 11 - from $410/nt- Book it! Trip Advisor FKN2124495 -This is an expansive, nonsmoking condo, rated as a 4-star, with a partial view of the Sherwin Mountain Range. It is perfect for families or small groups. Unload right at the front door. After a fun day on the slopes or on the lakes, relax in the indoor heated pool, spa or sauna. Then walk or take the bus to the nearby restaurants, theater or shops. 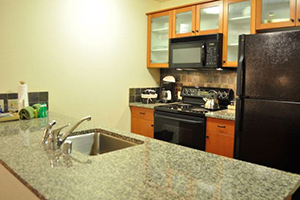 It boasts a gourmet kitchen with all the perks. Sleep in the nicely appointed 4 bedrooms which feature 2 kings, 1 queen, a bunkbed, a single bed and queen sofa sleeper in the living room. This property sleeps 11 people maximum. There are 3 bathrooms. An iron and ironing board along with a hairdryer are also provided. The dining room table seats 10 comfortably. Other features include 5 TVs, 5 DVD players, a VCR, CD and cassette stereo player, phone answering machine, wireless internet service, washer and dryer, gas BBQ, warmed with forced air and wood stove. This unit has 2 levels. The entry level has 3 bedrooms and two bathrooms. Upstairs is the living room, kitchen and the master bedroom with a bathroom. This 1800 sq ft condo is waiting for you! Wifi, Hot Tub.